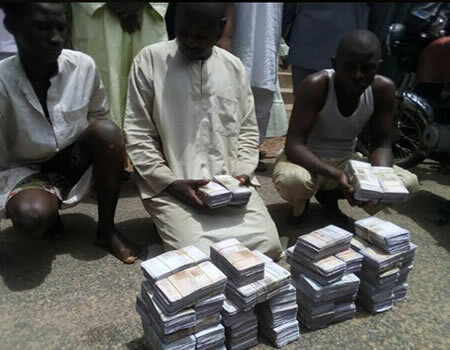 Gombe State Command of the Nigerian Police Force has declared that it has discovered fake notes totaling the sum of N22 million during a ‘stop and search’ operation aimed at stemming criminality in the state. While parading the suspects before newsmen in Gombe on Friday, the Commissioner of Police, Shina Tairu Olukolu disclosed that the men of the Federal Special Anti-Robbery Squad (FSARS), intercepted the syndicates of the fake currency dealers during a stop and search operation around Billiri local government area of the state. The Police Commissioner said that “As I have always said, crime does not pay. These suspects have been dealing in fake currency for so long but the long arms of the law have finally caught up with them today”. He added that “I want to reiterate the resolve and commitment of the entire officers and men of the Command that we will stop at nothing to eradicate crime and criminalities in the state”. While reacting to the allegation against them, one of the suspects, Sani Ibrahim confessed to Journalists that he became a dealer of fake naira notes to meet his basic needs due to the economic condition of the country. Sani Ibrahim who looked remorse while talking to Journalists said, “It is not my wish to produce fake Naira notes. It was one Alhaji (names withheld for investigation purposes by the Police) who brought me into this line of illegal business last year when the economy became tough for me and I approached him for assistance”. He further confessed that “We operate in Gombe and Nasarawa states because that is where we have people who trade in our fake currency”. Commissioner of Police assured that full-scale investigation is going on to track down all those involved in the criminal acts pointing out that as soon as possible they will be arraigned. Shina Olukolu also used the medium to warn politicians in the state to shun political violence as the Police will not tolerate any form of malpractices in the scheduled state congress of the ruling All Progressive Congress (APC) which is holding on Saturday in the state. He advised anyone who does not have any business in the conduct of the exercise to steer clear of the venue warning that anyone caught causing a breach of the peace will not be spared by the Police.